For the theme of Progress I wanted to reflect the way that my thoughts have changed throughout my journey with textiles. The idea of a learning curve always conjures up in my mind someone trying to push a heavy object up a steep hill, so I went with this imagery to fit my idea of progress. In this piece, the increasing size of the ball progressing up the curve reflects the ideas which are picked up on the way (like a snowball picking up snow). Each ball is underpinned by a column of words, which are repeated in each column. These correspond to the ever growing balls of knowledge as follows: – copy this, copy that – why not do this, why not do that – what happens if I try something else – some things work, some things don’t – there are no rules, I can do what I want and nothing is wrong, there are still so many things to explore. I hope that these show the way that my thinking has changed over time – in other words, my progress. The background is a piece of fine cotton which I dyed when I first did my City & Guilds and had been too timid to use when it was first done. The growing balls are needle felted strands of fleece onto a pre-felt which I made some time ago but didn’t know how to use. The smaller balls are a sort of ‘think bubble’, representing the way that continuing to work and ponder on the work takes me to the next level. 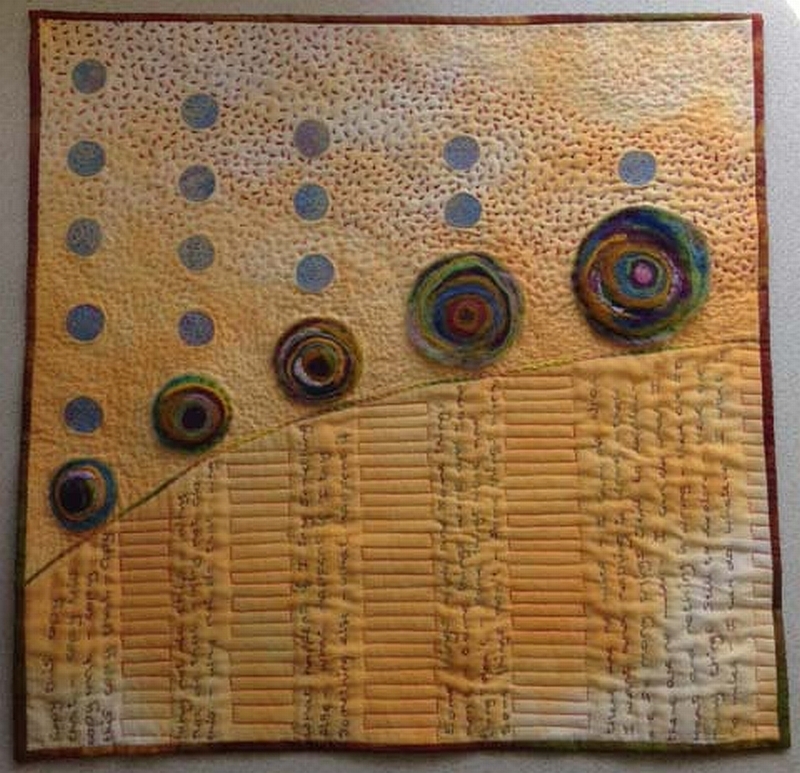 The area above the curve was seed-stitched in shades which progress round the colour wheel from yellow to purple. I worked the words in back-stitch, the curve in chain stitch. 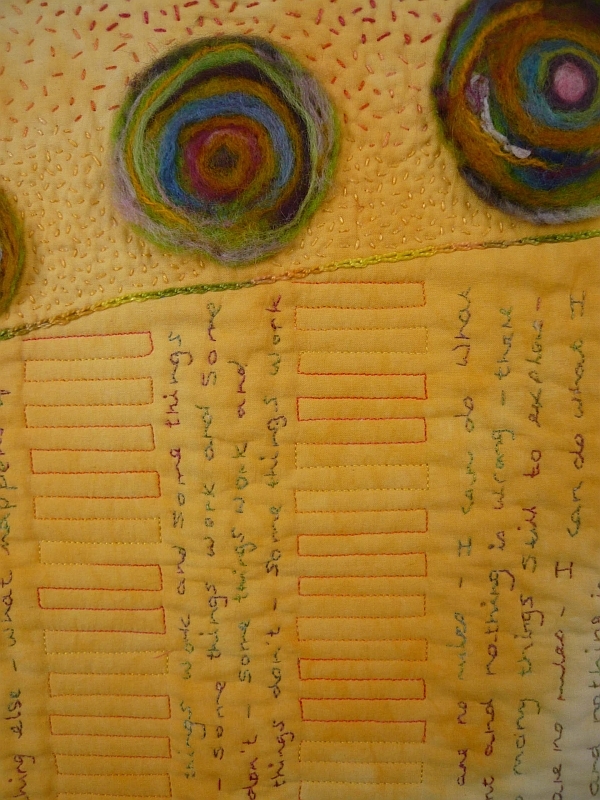 the spaces between the columns of words were my only foray into machine quilting for this piece, but hark back to a quilting pattern I have used on a previous piece. I love the colorful felted balls and the handwriting.